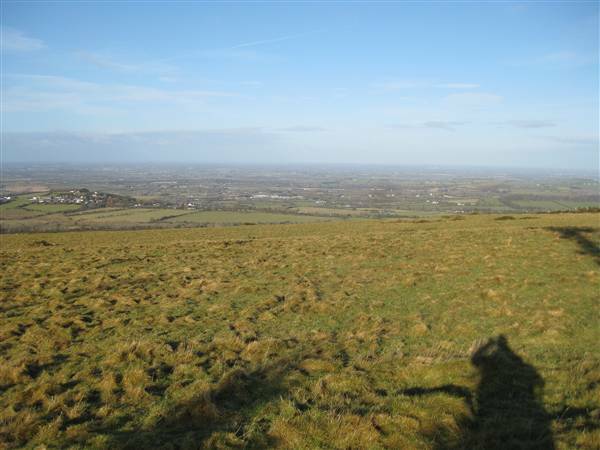 Cupidstown Hill at 379 meters is the highest point in Co. Kildare and lies close to the village of Kilteel – about ten minutes drive from Rathcoole off the N7. I was delighted with myself on Friday last (29th of January) as I embarked to tackle the first of 26 hills that make up the high point of each of the counties in Ireland. I’d spent a few months thinking about this ‘project’ and a couple of weeks researching what hills are involved and where they are located, so it was great to be finally under way. It was great to head out on that cold sunny day up a narrow road above Kilteel. The top of Cupidstown is about half a kilometer from the road so after confirming that I was in the right place I reached the trig pillar in no time. The hill doesn’t rate much as a destination but was pleasant on the day with fine views towards the west. I was glad of the trees that blocked a bitterly cold wind was howling from the Dublin and Wicklow mountains direction. 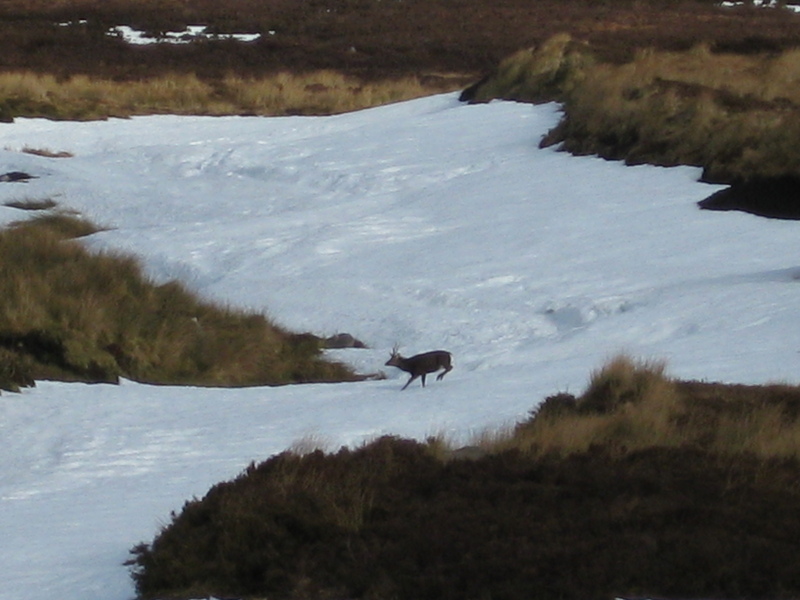 Judging by the amount of droppings there are plenty of hares about….I spotted one big fella running for cover as I approached. Next it was back to the car and on to Kippure. 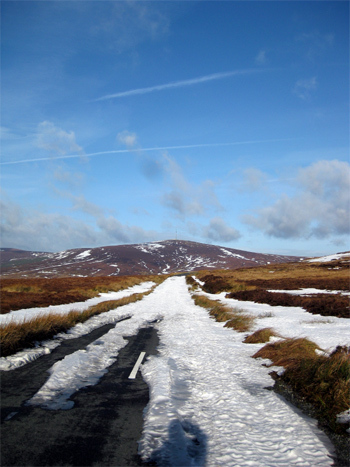 The drive up from the N81 is quite beatiful, though patches of snow by the side of the road grew increasingly common as the road climbed so I started to wonder what I’d meet when I got higher into the hills. By the time I reached the junction for the Sally gap and Military Road I was met with a long stretch of foot deep snow lying between me and the Kippure access road, so it was time for plan B.
I drove back down towards the N81 for a minute or so and parked up, deciding to bog trot towards Kippure for 40 minutes or before deciding if I was making any progress. When some clouds came in and it started to snow I decided to quit while I was ahead and return to the car. I was glad to have my bearing as the visibility dropped to a couple of hundred feet and all the views I had enjoyed quickly disappeared. A valuable lesson in how quickly the weather can changed. I sat in a hollow to enjoy my coffee while the snow fell before heading back to the car, sorry to have turned back from Kippure but excited to have my County Tops challenge under way. Coming from Rathcoole you’ll pass a church on your right when you reach Kilteel. About 150 meters after this take a left and follow this narrow road uphill. Keep to the left when you reach a fork and continue up the hill for about two minutes. As you approach the brow of the hill you’ll reach some evergreen trees on your left…time to park up. You can also approach from the N81. Coming from Dublin take a right turn immediately after a left turn offering directions for the Sally Gap. Follow this road up the hill for about 2km until you reach the trees which will be on your right just at the top. Once you have parked up it’s a ten minute walk to the ‘summit’ either via a path through the trees, or along the top of the field parallel to the trees on the Kilteel side of the hill. The summit is marked by a trig point and offers decent views of Kildare to the west, but sadly all views of the Dublin and Wicklow hills to the east are blocked by trees. This week,my husband heard this discussed on the radio.We are a family of 5 Mum,Dad and children aged 8,6,3. Today we embarked on our first hilltop climb to Cuppidstown Hill.It was very managable for the children. It was a misty, damp day but we really enjoyed it. Even the 3 and half year old managed it. It really is a stroll. We went up through a field and back down through the forest. Took no more than hald an hour, back to car and then off to town for something to eat. A great day. Look forward to the next one. Great to see that you enjoyed Cupidstown. I reckon that your entire family would also like Mullaghmeen in West Meath and Slieve Na Calliagh aka Loughcrew in Meath. I got a buggy containing a lazy three year old up Mullaghmeen while Lough Crew is only a short (but manageably steep) walk from the car park, and they are both really interesting locations in their own right and so well worth a visit. I’d love to hear how you get on if you go. Enjoy! Would you believe, its the next one we have planned. Have scheduled to do it Saturday week. ANYONE OUT THERE INTERESTED IN HIKING THE HIGHEST POINTS OF EACH COUNTY ??? ?